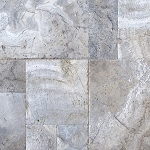 Silver 1 1/4 3cm Tumbled,Versailles Pattern are a set of tiles cut from grey travertine. The four pieces of rectangular and square tiles are designed to interlock and create a pattern known as Versailles. 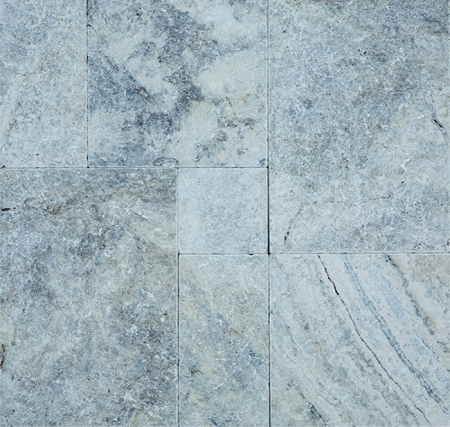 The surface of the tiles are made more interesting and dynamic by the silvery grey veins. The surfaces are slightly coarse due to the tumbling process. Silver 1 1/4 3cm Tumbled,Versailles Pattern is a practical choice for enhancing the beauty of any room. Arranging the tiles is also very easy as the pieces are already cut to the right size. The color is adaptable to both classic and contemporary designs. This elegant material is easy on the eyes and the pocket. It is also easier to maintain than other tile patterns because of the size of the pieces. 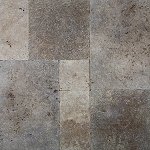 Silver 1 1/4 3cm Tumbled,Versailles Pattern is best used outdoors for driveways, garages, or garden patios.